One of the defining features of the neo-liberal era has been the buildup of private debt, particularly household debt. The banks and policy makers all assured us that this was fine because wealth was being built with the debt until, of course, it came tumbling down for many as a result of the GFC. Recent commentary on Australia’s record household debt problem and the increasing number of Australian households that are now on the brink of insolvency and cannot pay their bills seems to think this is a new outcome – the result of record low interest rates as thew central bank (RBA) tries to curb the descent into recession. The fact is that the problem emerged in the 1980s as neo-liberalism took hold of the policy process. We have to understand that period to fully appreciate the household debt problem now. The following graph shows household debt as a per cent of disposable income for 2015 (blue bars) and 1996 (red triangles) using OECD data. It is ranked low to high as at 2015. 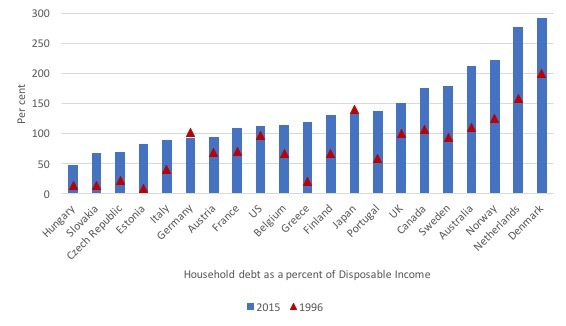 The next graph shows the percentage change in the household debt ratio between 1996 and 2015 for the same nations. Struggling Eurozone nations feature among the largest shifts. A recent report highlighted in the ABC report (January 9, 2017) – Wealthiest suburbs among most vulnerable to mortgage stress – showed that an increasing number of Australian households are entering a state of financial stress as a result of carrying huge mortgage debt. … around 20 per cent of “middle income” Australians have no room in their budget for unexpected expenses … rising unemployment or higher interest rates — could produce something like a catastrophe for households. See also – Warnings of financial ‘catastrophe’ as National Debt Helpline buckles under record call volumes (February 10, 2017). Australia sidestepped much of the economic fallout because of the nation’s ties to China. There was a huge surge in the demand for iron ore and coal, something Australia happens to be very good at producing. Which is now a convenient story being peddled by financial commentators but one which is fundamentally incorrect. – from 7,939 metric tons in 2007 to 7,265 in 2008, and 5,249 in 2009 (see Steel Statistical Yearbook, 2016). Australia’s coal exports (volume) fell by 3 per cent and metal ore exports (volume fell by 6 per cent) between the September-quarter 2008 and the March-quarter 2009 as a result of declining world demand. Overall, Australia’s exports fell by 2 per cent between the March-quarter 2009 peak and the June-quarter 2009 trough. Total exports as a share of national output fell from 24.7 per cent in the December-quarter 2008 to 18.3 per cent in the December-quarter 2009. Between November 2008 and May 2009, Mining employment fell from 172.2 thousand persons to 157.9 thousand (a decline of 8.3 per cent). Mining production (value added) fell from $A9,983 million to $A9,695 between June 2009 and June 2010 (a decline of 2.9 per cent). Australia’s current account remained firmly negative throughout the period of the crisis (and as it has since the mid-1970s). So Australia’s resistance to recession in the early days of the GFC were not due to our export sector or to mining specifically. It contracted. The reason Australia did not record a technical recession during the GFC was due largely to the timely and substantial fiscal stimulus that the Australian government introduced in late 2008 and early 2009. It is true that commodity prices recovered on the back of another fiscal deficit – the Chinese government’s own stimulus package which saved that nation from descending into the morass that the US, the UK and the Eurozone etc were determined to fall into. Fiscal policy settings also have a lot to do with the rise in household debt as I will discuss next. Fast-forward to July 2014, and the price of iron ore was in the middle of a worldwide sell-off. Commodities prices crashed, as did Australia’s terms of trade. Which built on the disastrous attempt by the previous Labour government in 2012 to ‘consolidate’ its fiscal position (aka hacking into discretionary net public spending) because all and sundry (except me) were claiming Australia was about to run out of money and the deficit (that saved the nation) was too large. It was idiocy no doubt. And since then the Australian economy has stalled and the labour market gone backwards. The more recent downturn in the Mining sector has compounded that to some extent, although the contribution of that sector to the Australian economy is relatively small – although you wouldn’t know that from the interminable promotional material and statements that come from the sector lobbyiests. The ABC article thinks that the household debt problem has arisen because the central bank cut interest rates to protect the economy from the decline in commodity prices (they did not) and “some of the cheapest borrowing rates in history” have spawned a housing bubble, which has increased the size of mortgages. Commodity prices peaked in January 2014 and then started falling sharply. The RBA started cutting its Cash Rate Target from 4.75 per cent in October 2011 in response to the slowing growth arising from the Federal government’s austerity push. Between October 2011 and the time commodity prices started falling in February 2014, the RBA had already cut the policy rate 11 times (down to 2.5 per cent). It has cut the rate further (to 1.5 per cent) but it was easing monetary policy long before the commodity price decline. Again, it is a convenient story to tell about housing prices and interest rates etc but the facts do not fit the journalist’s story. While the journalist appears to give the impression that the household debt situation is a recent problem – driven by low interest rates – the facts are that the issue became apparent in the 1990s, when my professional colleagues were tinkering with DSGE-New Keynesian models without banking or financial sectors and telling the world that the ‘business cycle’ was dead. All they wanted to intone was that more deregulation was necessary to achieve even better outcomes. Since then real GDP growth has been on average lower and income inequalities have risen. 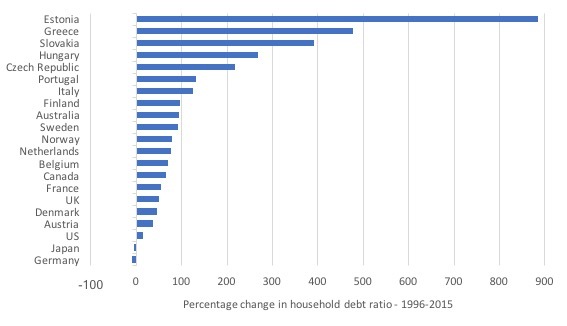 And, given the topic of today’s blog – household debt has skyrocketed to dangerous levels. The ABC report gives the impression that the household debt escalation was a price issue – lower interest rates. In fact, history tells a different story. The ABC report and many that have preceded it on the same topic – the debt vulnerability across Australian households – miss the basic point that the massive build up of private debt and the pursuit of fiscal surpluses are intrinsically related. They are part of the neo-liberal dream – which is, as history has shown us – in fact, a nightmare. Australian households are currently carrying record levels of debt (mostly mortgage related) – 186.9 per cent of disposable income and rising, with interest payments as a percent of disposable income standing at 8.4 per cent. The following graph shows total household debt as a percentage of disposable income since 1988 to September-quarter 2016 (latest data). 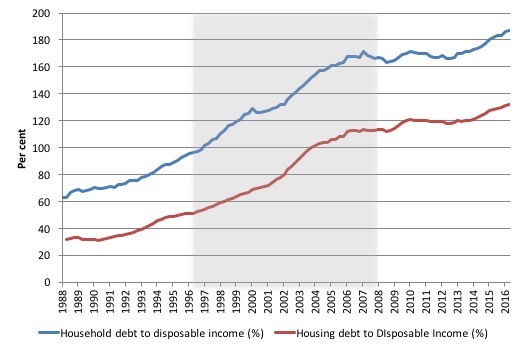 The blue line is total and the red housing mortgage debt. The shaded area is the 10 out of 11 years of fiscal surpluses that the last conservative government recorded – driven, initially, by the growth that followed the unsustainable private credit binge. Financial deregulation in Australia began in the early 1970s while the exchange rate was still fixed (despite the breakdown of the Bretton Woods system in August 1971). Only modest changes occurred in this period (changes to controls on interest rates for trading banks, for example). It was not until the exchange rate was floated in 1983 that the pace of change accelerated. Foreign banks entered the local economy and a host of controls on domestic banking was abandoned. This was the beginning of the neo-liberal period. It was also the start of the process of real wage suppression and a massive redistribution of national income towards profits. Like all these changes, unintended consequences soon appeared. As real wages growth began to lack behind GDP per hour worked (labour productivity) as the result of specific policies introduced by the then Labour government in Australia (but following the global neo-liberal trend), it was claimed the redistribution of national income back to profits would lead to a boom in private capital formation (investment). The shift in national income shares was also aided by privatisation; outsourcing; pernicious welfare-to-work and industrial relations legislation; the National Competition Policy to name just a few of the neo-liberal (‘free trade’) policies that were introduced to ‘save’ the nation. No investment boom materialised. Instead, a major Marxian realisation crisis loomed. If the output per unit of labour input (labour productivity) is rising so strongly yet the capacity to purchase (the real wage) is lagging badly behind – how does economic growth which relies on growth in spending sustain itself? This is especially significant in the context of the times because the Labour government became obsessed with the macroeconomic counterpart to its microeconomic agenda (privatisation etc) – it wanted to run fiscal surpluses, even though the external sector was running large deficits itself. If the federal government achieved its fiscal aims (surplus) then it could only come by the private domestic sector increasing its indebtedness, given the external deficit. In the past, the dilemma of capitalism was that the firms had to keep real wages growing in line with productivity to ensure that the consumption goods produced were sold. But, in addition, to the labour market deregulation, the federal government embarked on wide scale financial market deregulation, which solved the realisation problem while simultaneously suppressing real wages growth and pushing an increasing shares of the national income produced towards profits. Financial market deregulation created a whole new breed of parasites who preyed on Australian households. This was, of course, a global trend. While engineers built safe bridges etc, the new breed of ‘financial engineers’ set about undermining the bridges that household saving had made to ensure a secure future (and retirement). In the late 1980s, these characters (financial planners and all the rest of the names they came up with to describe themselves) pushed ever increasing debt onto the household sector. Due to the financial market deregulation, financial institutions proliferated. These financial engineers were able to represent themselves as independent experts only interested in the well-being of the suckers that came into their midst, while, unbeknown to their clients, they were pushing specific products that gave them commissions from their ’employers’ the banks. “Aah, yes, I have just the product for you and your family – Product A is superior” – cash register rings in the background toting up the commission! The capitalists found that they could sustain purchasing power and receive a bonus along the way in the form of interest payments. This seemed to be a much better strategy than paying higher real wages. The household sector, already squeezed for liquidity by the move to build increasing federal surpluses were enticed by the lower interest rates and the vehement marketing strategies of the financial engineers. The financial planning industry fell prey to the urgency of capital to push as much debt as possible to as many people as possible to ensure the ‘profit gap’ grew and the output was sold. And greed got the better of the industry as they sought to broaden the debt base. Riskier loans were created. People started to borrow to speculate in share markets (margin debt). Credit card debt rose quickly (with exorbitant interest rates – largely hidden from the consumer). This was a global trend. Eventually the relationship between capacity to pay and the size of the loan was stretched beyond any reasonable limit. This is the origins of the sub-prime crisis. The graph above shows this escalation. 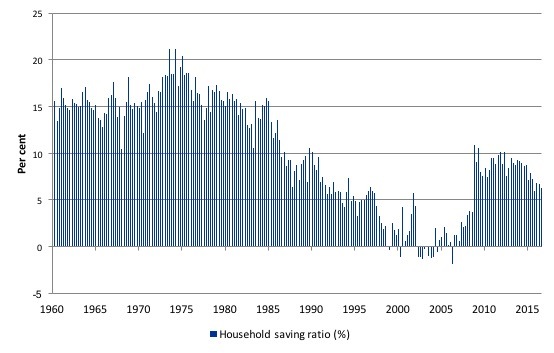 The other side of that credit behaviour is the Household saving ratio, which is shown here (as a percent of disposable income) over the same period (March-quarter 1980 to September-quarter 2016). As the households were piling on the debt under the duress applied to them by the voracious financial engineers working for the large banks they actually started dissaving (negative saving) for a few periods in the lead up to the crisis. Historically, the ratio has averaged around 15-16 per cent but in the neo-liberal era that average started falling. As the fiscal surplus fetish became more entrenched and governments bowed to the self-regulating free market myths and allowed financial markets to run loose, the ratio fell sharply to below zero. With the onset of the GFC, Australian households have shown a desire to return to their previous behaviour and the saving ratio returned to around 10 per cent as they try to stabilise the out-of-control debt levels. The ratio has fallen in recent years again as the national government has squeezed incomes through austerity and the terms of trade have declined sharply. The shaded area in the household debt graph is interesting. The Australian conservative government took office in 1996 and recorded 10 fiscal surpluses out of the next 11 years until it lost office in 2007. The Australian economy delivered substantial growth in tax revenue during this period and while average real GDP growth was down on its pre-neo-liberal levels, it was still solid. So how did the economy keep growing with the federal government running ever increasing surpluses and the external sector in consistent deficit? Well, from 1996 it was only because the buildup in household debt that kept consumption growth moving and generating robust growth in tax revenues. The ‘one-in-a-hundred years’ mining boom came much later. Had the financial markets not foisted so much debt onto households, the federal government would not have been able to get away with the increasing fiscal drag it imposed on the economy in the form of the surpluses. Within a year of two, the economy would have moved into recession and the tax revenue dried up. My profession largely ignored these trends and urged the government to quicken the pace of deregulation – which would have made the problems worse. The only difference now is that I no longer use the term ‘budget’ to describe the federal government’s fiscal balance. … a major shift in monetary and fiscal policy is required and must begin with an acceptance that public deficits are typically required to maintain stable growth rates in spending and sustainable levels of private sector debt. The government can clearly run surpluses for a time by exploiting the willingness of the private sector to increase its debt levels. But this strategy becomes highly deflationary once private agents seek to restore their balance sheets. The resulting output corrections force the public sector into deficit with accompanying private wealth losses and rising unemployment. In this context, the argument that budget surpluses are needed to ‘fire-proof’ the economy is nonsensical. For the small number of Modern Monetary Theory (MMT) economists of the time (1990s) it was fairly obvious that the blindness of the mainstream macroeconomists was leading to policies that were going to end in grief. And so they did. And now these mainstream characters write blogs saying they knew it all along. Literature is good for posterity. It also tells us who said what, when and who is lying now about knowing stuff then! 1 . With household debt being so high – and denominated in nominal monetary terms (not in real terms) then it means that the central bank has limited capacity to raise interest rates – any significant movement in rates would trigger a raft of personal insolvencies that would further dent non-government spending. 2. Further, any policy that undermines nominal wages growth (like attempts to scrap penalty rates for weekend workers etc) will also trigger insolvencies on a wide scale. Mortgage contracts are honoured by delivered a certain amount of money to the lender per period. Cutting money income undermines that capacity. This is often overlooked by my profession as they advocate cutting ‘real wages’ via money wage cuts (except their own that is). 3. The question you always need to ask is this: If households are seeking to maintain higher saving ratios, does this not signify that the Government should return to its historical behaviour of running more or less continuous fiscal deficits, especially given the other historical fact that remains unchanged – that Australia runs external deficits, which continually drain spending and undermine growth? Australia is like most nations in this neo-liberal era. We run external deficits, have households with massive nominal debts, and governments that claim they need to run fiscal surpluses to safeguard their credit ratings. The three facts are also mutually incompatible with sustained growth and financial stability. This is not a new thing as many commentators are trying to make out. It hasn’t suddenly happened as a result of record low interest rates. The household debt problem predates any of those policy shifts. The government must run deficits in these cases (and normally) to provide income support via growth to the non-government sector so that it is not squeezed into increasing indebtedness and can maintain consumption via real wages growth. The government must also maintain oversight in financial markets to curb the greed of the banksters. So it’s all the fault of “neoliberalism” is it? The definitions of “neoliberalism” that appear in dictionaries of economics are near meaningless. Plus the word is now even nearer total meaninglessness due to overuse. But human beings love mantra. And Bill’s conclusion is “The government must also maintain oversight in financial markets…”. Well we can all drink to that, but it doesn’t answer the crucial question: exactly what should that “oversight” consist of? The UK’s Independent Commission on Banking devoted thousands of person hours to that question and ended up producing a load of hot air in my opinion. Same goes for the Basel lot. As for Dodd Frank, that consists of about ten thousand pages and counting, which means it is no more than a lawyers’ paradise. My preferred and vastly simpler solution is full reserve banking. Under FRB interest rates are higher, so there is less debt. Second, where loans go wrong, those funding the loans foot the bill: there is no way taxpayers take a hit. Third, it is plain impossible for banks to fail (absent large meteor strikes and political revolutions). Fourth, private banks are barred from printing money: only the state creates money. David Hume and the French Nobel laureate economist Maurice Allais described private money printing as “counterfeiting” and quite right. Prof Richard Werner described it as “fraud”. Right again. Ralph- surely we have, by now some shared understanding of what ‘neo-liberalism’ means? After nigh on 40 years of its ravages and rapacious rampage we sort of know, don’t we? Well, that’s my go at it – any other suggestions? Not a bad definition. For a shorter one how about: “belief in free markets”? But I’m wary of invoking “neoliberalism reduction” as the cure for everything because it doesn’t really tell you what the best solution to specific problems (like bank crashes) is. Could be that the best cure for banks is giving market forces more of a free rein in some ways, and less in others. Taxpayers never take a hit unless the government takes action to increase taxes. From Wikipedia: Neoliberalism refers to the 20th century resurgence of 19th century ideas associated with laissez-faire economic liberalism. These include extensive economic policies such as privatisation, fiscal austerity, deregulation, free trade, and reductions in government spending in order to increase the role of the private sector in the economy. The implementation of neoliberal policies and acceptance of neoliberal economic theories in the 1970s are seen by some academics as the root of financialisation, with the financial crisis of 2007-8 as one of the ultimate results. I’m delighted to hear the multi billion/trillion dollar rescue of banks didn’t cost the taxpayers in Main Street anything. Like most residents of Main Street, I smell a rat. You are of course right to say that taxes were not raised to fund the rescue: the Fed just printed trillions and loaned the money out. But it was loaned at a near zero rate of interest. That compares with the 10% that Warren Buffet charged Goldmans when Goldmans were short of cash during the crisis. That 10% is presumably a more realistic rate. So effectively the Fed gave money to private banks. As an alternative it could have implemented stimulus by giving money to taxpayers / residents of Main Street, and letting the bank industry contract. So in effect, taxpayers funded bail outs. Of course it is very difficult for governments to organise an orderly contraction of the bank industry without the whole industry collapsing and taking the economy with it. In short, bankers have got governments by the balls. I’m sure bankers devote a huge amount of thought and effort to ensuring that things stay that way. The Last 2 quarters have shown trade surpluses … My understanding is that its because of LNPs policy of austerity driving down the volume of imports. Does it look like that these trade surpluses will continue ? Or is there more to this ? Mark- That’s interesting as austerity tends to increase cheap imports (from China)as the need for ever cheaper goods increases with indebtedness. Bill might have a perspective on this. Ralph, I have read your posts and some of your writing on your website and though I am new to MMT and learning (but then I have a formal tertiary level financial education) it is clear to me that you do not understand it or you would not be writing such things. That you have been doing it so long shows that you are wedded to a belief system and cannot let go of it which is a common problem throughout the world. You need to read this book by Warren Mosler. After reading Warren Mosler’s book and Professor Mitchell’s work how can you not ‘see’ it? If we can work that out, perhaps we can reach a lot more other people too. Explain a concept in another way that all can understand. Firstly I don’t follow the logic in your statement that “… effectively the Fed gave money to private banks. As an alternative it could have implemented stimulus by giving money to taxpayers / residents of Main Street, and letting the bank industry contract. So in effect, taxpayers funded bail outs.” Perhaps you would oblige by carefully spelling out the logic for me. Secondly, I don’t believe it would not be overwhelmingly difficult for the central government to organize an orderly contraction of the commercial banking industry without bringing down the entire economy, contrary to what you have suggested, providing there was a will to do so. Banks observed to be insolvent would be declared to be so, and their shareholders would be wiped out. Simultaneously the failed banks would be immediately nationalized and run as state banks, in order to prevent a panic and preserve the money supply. Their role as state banks would continue for as long as is required for the initial recapitalization costs to be repaid. This article from Bill refers several times to “tax revenue” by which I assume he means “govt income from taxes”. But MMT specifically states that taxes DO NOT create any form of revenue and those dollars are effectively destroyed. Both can’t be right. I am not trying to nit-pick, just trying to understand MMT to my fullest ability, so then my questions is: to whom are tax receipts counted as “revenue”. I also noticed that Bill says “I no longer use the term ‘budget’ to describe the federal government’s fiscal balance” yet he still talks about deficits and surpluses which clearly link back to ‘budgets’. I feel that the term ‘budget’ is useful (and understood) but the terms deficit/surplus are extremely misleading (and misunderstood). Couldn’t we say “budget boost” and “budget brake” and get the message across more effectively? If a lender lends at a “sweetheart” rate of interest (e.g. about 0% when a realistic rate is 10%) that is a gift isn’t it? Figures are hard to come by here presumably because the revolving door brigade is keen to hide the actual amount of the gift. But far as I can see the Fed loaned about $600bn for about 18 months. Taking the above 10%, that means the total “gift” was about $90bn. But those are just back of the envelope calculations. The purpose of those loans / gifts was to impart stimulus or reduce the extent of economic contraction. But an alternative would have been conventional fiscal stimulus: i.e. giving or spending money into Main Street. So why didn’t the authorities go for that? Reason is that the entire bank system was on the brink of collapse. I quite agree that in theory shareholders of banks which are bust should be wiped out with the state taking over. But I’m not sure how easy that would have been in the middle of a panic. Also I’d guess the idea is unthinkable in the allegedly “capitalist” USA. That’s capitalism as in “socialism for the rich, and capitalism for the poor” (ho ho). Can you please give a brief explanation of the term ‘tax buoyancy’ and what does mmt have to say about it? I think Ralph meant that even if taxpayers didn’t pay for bailouts, the people in government thought that bailout was paid by people so now they can’t pay for anything else. Full reserve banking? that’s like banks have to come up with deposits before it can loan? Or were you referring a bank’s reserve account at the FED? I don’t know if they can do that. Full reserve banking would mean that banks can only create deposits equal to their reserves minus their existing demand deposits. So this’ll typically mean, on the liability side, time deposits (aka certificates of deposit) and equity. Banks don’t “come up with” deposits any more than you “come up with” owing someone else money. As far as I can tell, it’s the clarion call of people who are afraid of debt but don’t really understand the subject well enough to identify the real problems, much less offer real solutions. You claim in relation to full reserve: “As far as I can tell, it’s the clarion call of people who are afraid of debt but don’t really understand the subject…”. Well I can think of an equally silly criticism of opponents of full reserve: the “don’t really understand the subject”. If you’d care to make some SPECIFIC criticisms of full reserve, I’d be happy to deal with them. But the “don’t understand the subject” line is not too clever. Ralph, your definition of neoliberalism is terrible. John Herman has provided a kind of definition of what can be considered to be a kind of neoliberal political philosophy, for virtually all of John’s example are political in character. Let me try a definition. The term, ‘neoliberalism’, can be viewed as a marriage of a kind of political philosophy and neoclassical economic theory, which has, among its fundamental assumptions, the perfectly rational agent (individuals usually), free market principles, and what is known as the ergodic axiom, which says effectively that the future will be much like the past. A special case of this axiom is the contention that market distributions are effectively normal, or Gaussian, which means that it is possible to produce risk calculations. Mandelbrot, however, showed in the sixties that market distributions were in fact far from normal (Gaussian) and that they exhibited what is known as a Mandelbrot or Cauchy distribution which has no calculable mean or variance. This means that risk calculations are impossible. This didn’t stop them from being calculated. Some in the financial sector no longer believe that market distributions are normal in character but that hasn’t stopped them carrying on. Bill and others have conclusively shown that the notion of the completely rational agent, which implies perfect information, is completely false, as is the notion of the free market and its associated assumption that it clears all transactions. Logical considerations alone should have strongly suggested to these characters that the notion of the completely rational agent was nonsense. If we look at neoclassical economic theory this way and its fit with a particular political philosophy, it is easy to see that the policies that John Herman lists fit beautifully, like a hand in a properly fitting glove (unlike OJ Simpson’s). This makes it easy to come up with a particular kind of story. There is another factor here, and it is that neoliberalism (= a variant of political philosophy + neoclassical economic theory) suits the rich and their lackeys. This means that one can easily drive a story that suits a certain set of vested interests, interests which can and do exert political influence. A marriage made in heaven for winners in this scenario. Ralph, I suggest a read of Richard Werner’s article describing his experiment testing three theories of banking. It is “Can banks individually create money out of nothing? — The theories and the empirical evidence” which appeared in a 2014 issue of the International Review of Financial Analysis. It has relevance to your thesis about full reserve banking. Thanks for directing me to Werner’s work. I am well aware of its contents (basically the point that private banks print money) and fully accept that basic point. It is precisely the ability of private banks to print money that I object to as does Werner. Allowing private banks to create money is a subsidy of those banks in much the same way as a backstreet counterfeiter is subsidised by community at large. That’s the basic flaw in fractional reserve banking and the basic argument in favour of full reserve banking, far as I can see. Ralph, private banks don’t print money, they create it without them printing it. When they give a loan, they need to get the money the owe from the central bank – in the US, the national currency is printed or cast by the US Mint, of which there are three or four. Some coins are stamped, showing the mint that created them. Fractional reserve banking theory is false. It is the credit creation theory that correctly describes what banks do. Whether they should be able to do this independently of the central bank is another question. If it is felt that this is a a poor practice, then nationalize the banks. You don’t strike me as someone who’s willing to be wrong; that’s the reason I’m not interested in engaging on the subject. For my part, I’m more interested in mechanics than theory (which is the draw of MMT, after all), and trying to think through the mechanics of full-reserve banking doesn’t go anywhere. One possibility would be for nearly all private debt to end up housed at the central bank, at which point you don’t have any less debt than you do now but people would endlessly crow about “moral hazard.” So as a practical matter that’s probably out. I suspect the more likely outcome would be a return to the pre-20th century banking: people still want to take on debt, so the constraints on reserve bank debt issue would simply move debt out of reserve banking, and reserves would stop being the asset opposing most private debt. Thus you’d get nonreserve banks issuing bank notes (i.e., marketable securities) but without the parity guarantee, regulation, or deposit insurance of the current system. That would be a disaster (or rather, that was a disaster last time it was tried) and we’d return to the current system after the first major crisis. You probably imagine a world with next-to-no private debt, which is incredibly daft, but you’ve already made up your mind. Re your point that “private banks don’t print money, they create it without them printing it”, I think everyone has worked out that private banks like Barclays or Lloyds do not literally print £10 notes. I was using the word “print” in an allegorical sense. Thought that was obvious. (In the UK, private banks were barred from printing their own notes in 1844). Next, you say that private banks “create” money: yes that’s correct, as the opening sentences of this Bank of England article explains. Re your suggestion that if fractional reserve is deemed “poor practice” banks should be nationalised, numerous economists have explained over the years that it is perfectly feasible to dump fractional reserve and implement full reserve without nationalising banks. Those economists include at least four Nobel laureate economists: Maurice Allais, Milton Friedman, Merton Miller and James Tobin. Whether banks should be nationalised is a separate question. I’m much amused by your claim that I’m someone who is not “willing to be wrong”. Quite right. Silly me: I much prefer being accurate and right. You then say that for that reason you don’t want to “engage with me”. Fair enough. But you then launch into three paragraphs of engagement. I’m very confused by this – silly me (again). Or perhaps it’s you that’s confused. I’ll leave that for readers to decide. Next, you claim that one version of full reserve involves “all private debt being housed at the central bank”. Well none of the advocates of full reserve I’ve come across (Milton Friedman, Lawrence Kotlikoff, John Cochrane, Richard Werner to name but four) advocate the CB taking over those debts. If you’re interested, see for example Friedman’s book “A program for monetary stability” second half of Ch 3 in particular. See also my book on the subject: “The Solution is Full Reserve / 100% Reserve Banking”. It’s supposed to be available for free online, but the server was down when I looked just now. I’ll chase that up in a day or two if the problem persists. Click on the image of the book on my site “Ralphonomics” in a week or two. Finally, you say “You probably imagine a world with next-to-no private debt, which is incredibly daft…”. Thankyou for that bouquet. In my book I most certainly do not propose a world with next to no private debt, and nor do any of the other advocates of full reserve I’ve come across. Thanks for the response earlier, Sean. If Milton Friedman supports something, I have to be careful because he is a fishy dude. The answer to which would seem to address your primary objection to the status quo i.e. that private rentier interests are benefitting unfairly from the system. Or am I misinterpreting you?